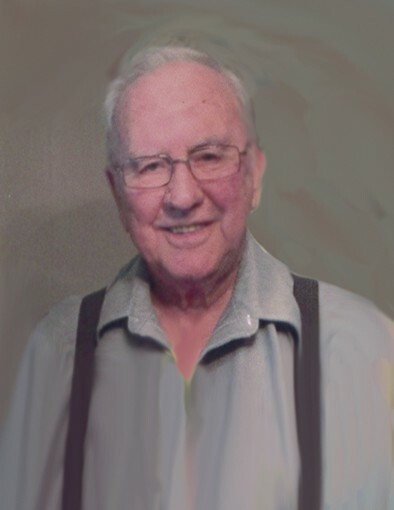 Lyle E. Halstead, 90, of Omaha, Nebraska, formerly of Whiting, Iowa, passed away on Saturday, January 19, 2019, at Immanuel Medical Center in Omaha. Funeral services will be 11:00 A.M. Thursday, January 24, 2019, at the Faith Lutheran Church in Onawa, Iowa, with Pastor Marsha Smith officiating. Graveside services will be 4:00 P.M. on Thursday, January 24, 2019 in Fairview Cemetery in White, South Dakota, with military honors provided by the Higgins-Jessen American Legion Post #88 of White, South Dakota. Public Visitation will be 10:30 A.M. – 11:00 A.M. Thursday, January 24, 2019, at the church. Arrangements are under the direction of Rush Family Care Service in Onawa. Lyle Eugene Halstead was born on March 11, 1928, at Brookings, South Dakota, to Orlo and Edna (Lamster) Halstead. Lyle was named by his mother and later nicknamed “Orville” by his father. This nickname remained for life. Lyle was raised on the family farm southeast of White, South Dakota, and attended school in Sherman Township and high school in White. In 1945 and 1946, he served in the U.S. Merchant Marines under the U.S. Coast Guard with the rating of Fireman 2nd Class, life boatman, and Oiler in the engine room. Lyle received an Honorable Discharge on July 20, 1946. After returning home, he was employed as a milkman at the College Creamery in Brookings, which eventually led him to entering into a partnership in Longville Dairy in Longville, Minnesota. Lyle was baptized as a child by his Uncle Harris Halstead, pastor of a Methodist Church in Brookings, and was later confirmed into the Lutheran faith in 1952. Lyle married Beverly Ann Engen at Leganger Lutheran Church in Toronto, South Dakota, on June 17, 1950. They purchased the family farm and farmed until 1964. He then changed his occupation to become an Independent Professional Insurance Adjuster, working any type of claim and for all companies, and retiring in 1993. He did make one break in 1956-57 and was half owner and operator, along with his brother-in-law Doyle Aslesen, in an International Harvester Company Implement dealership in Clark, South Dakota. Lyle was always active and enjoyed music and had a very large collection of records, CDs, music videos, and tapes in excess of 60,000 songs that he enjoyed sharing with family and friends. He also enjoyed hunting, gardening, playing cards, and dancing. He also played the steel guitar for many years. He also enjoyed riding bicycle and playing board games with his grandchildren. After retiring, Lyle and Beverly enjoyed going to dances and music festivals, cookouts, and taking many road trips covering 48 states and a large portion of Canada and Mexico, as well as a cruise ship to the Bahamas. Lyle is survived by his wife of 68 years, Beverly Halstead of Omaha, NE; one daughter, Sharleen (Bruce) Maxwell of Blair, NE; three sons, Brian Halstead of Omaha, NE, Arlin (Amanda) Halstead of Omaha, NE, and Lyle (Maureen) Halstead of Clarksville, TN; eight grandchildren, Todd (Sarah) Maxwell of Omaha, NE, Brett Maxwell of Omaha, NE, Kami (Conor) Maxwell-Dworak of Omaha, NE, Emily Halstead of Rapid City, SD, Ben Halstead of Omaha, NE, Chelsea (Rick) Bart of Williston, VT, Janelle Halstead of Camby, IN, and Michala (Avery) Brooks of Fort Wayne, IN; four great-grandchildren, Alice Maxwell, Liam Maxwell, Kaylyn Graves, and Wyatt Maxwell; and one sister, LaVonne Aslesen of Sioux Falls, SD. He was preceded in death by his parents, Orlo and Edna (Lamster) Halstead, and four sisters, Genevieve Simmons, Wanita Nagel, Orva June Sorbel, and Garnet Brush.